This Christmas season cattle folks had the chance to show some urban kids that steak doesn't just come from a store. And they demonstrated that the same ranchers who care for cattle also care about children in tough situations. 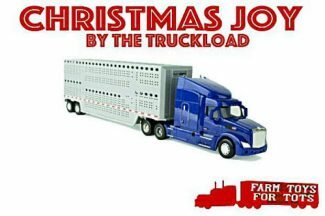 In November, a website called vegan.com posted a photograph of a toy semi truck — more specifically an ERTL Big Farm 1:32 Peterbilt Model 579 Semi with livestock trailer. The caption with the photo simply read, "Seriously, Walmart?" Vegan readers of the website soon responded. One reader tweeted, "This is unimaginably disgusting. Walmart selling a toy slaughter truck. #vegan." Others called the truck a symbol of "barbaric treatment of innocent animals" and a toy that showcases "the reality of violence in agriculture." One reader urged Walmart not to "support the desensitization of children." With the public outcry, vegan activists began circulating a petition that demanded Walmart immediately pull the toy semi truck from the shelves of its 11,500 worldwide retail stores. Once the agricultural industry got wind of this petition and the corresponding backlash on social media, four agricultural advocates banded together to do something about it. The four warriors: Carrie Mess of Wisconsin; Diana Prichard of Michigan; Ryan Goodman of Montana, and Katie Lukens Pinke of North Dakota. "When I saw the petition to remove the livestock haulers from stores, my immediate reaction was to do the exact opposite: to buy as many as possible and get them into the hands of kids all over the country," said Prichard, a hog farmer and author of "The Cow in Patrick O'Shanahan's Kitchen." "I know and trust Katie, Carrie and Ryan from their work in agriculture online and knew we would get the best reach and results from collaborating." The four agricultural advocates teamed up to launch Farm Toys For Tots with the intentions of raising money to purchase these toy semi trucks and other farm and ranch toys to kids in need. Through a Go Fund Me site, the group quickly raised $7,250. "We have a small army of 'farm elves' across the United States distributing toys," said Lukens Pinke. "It's agriculture advocacy at its finest for Christmas — grassroots and giving back. Personally, I don't think reacting to activist actions with online dialogue influences the "movable middle" audience. We tend to give too much time and attention to the screamers on issues. This is a positive way to create opportunities for kids to receive agriculture based farm toys for Christmas. Farm Toys for Tots supports Toys for Tots organizations across the country by donating farm toys to their cause. "We closed donations on Dec. 1 and now comes the buying of toys and drop off at locations," added Lukens Pinke. "I hope this becomes an annual effort that grows. You can donate farm toys yourself to local causes and give us a 'like' on Facebook to stay posted for next year's efforts. Aside from donating toys to kids in need, the fundraiser also started a conversation with consumers about where their food comes from. "My farm kids are acutely aware of the cycle of life and death and intimately familiar with where their food comes from," said Prichard. "Our freezer is filled with pork from pigs they fed, watered, named and scratched behind the ears. Our beef is from a steer they halter-trained as calves. Our chicken comes from meat chickens that were raised entirely by my ten-year old. If anything, I believe that an intimate relationship is our best safeguard against violence in the meat supply chain. They know and care for these animals and make sure everything that what happens to them is as low stress as possible. I always tell people, fatal violence to a pig or cow is a predator attacking it and brutally bringing it down and my processor isn't in the habit of doing that. How we do it never even registers on the animal's mind as being threatening let alone violent." In addition to growing up in agriculture, Lukens Pinke and Prichard believe that farm and ranch toys can help share the meat production story with kids in a way that they can understand. "Farm toys ignite a passion in agriculture for our next generation," said Lukens Pinke. "We need a next generation in all rural areas. Realistic toys that inspire skills and passion spark the interest! My husband and I own a small town lumberyard and home building business with my in-laws, and 95 percent of our business is agriculture-related. I see first-hand the need for tradespeople of all kinds, both in agriculture and non-ag. I think back to the farm toys my parents and grandparents gave my siblings and I as kids and the years of 'carpet farming,' which led to a passion in agriculture for all of us. We need the next generation on our farms and ranches, and also welders, mechanics, ag technology specialists and trainers, truck drivers, plumbers, electricians and small business owners of all kinds." Farm Toys For Tots has become one of those exemplary efforts where agricultural advocates have turned something negative into a positive. "The response has been 110 percent positive and I think it reached both ag and non-ag audiences. It's an effort anyone can be a part of easily, and hopefully it will grow in the future. I hope it inspires more people to collaborate on positive reactions and efforts. I have never met Diana Prichard in person, but know her work and trust her, but I do know Carrie and Ryan through agricultural advocacy work. Even though we are hundreds of miles a part, all four in different states, we worked together to accomplish this task. Diana's idea for Farm Toys for Tots proves that anyone can work together and make an effort to accomplish a common goal." The Farm Toys for Tots Facebook page can be found at: facebook.com/farmtoysfortots. Stay tuned for updates on this year's donations, as well as ways to donate to the cause in 2016.